…the author does a very good job of depicting the daily activities of a family when you grew your own food and harvested it and cured it, too. The historical context makes the story interesting in its own right, and the mystery just adds some spice to the mixture. … the time in history is accurately represented and the plot is complex. Get yourself a copy and see what you think. The characters are well-drawn and interesting, especially Alafair and Shaw Tucker… On the whole this was a charming and entertaining mystery. Ghosts and superstition play a certain role for the environment and the atmosphere, but the solution of the crimes does not depend on anything supernatural. In spite of the PDF format, it was a fast read, and I wouldn´t mind meeting the engaging Tucker family again. Crying Blood begins with a simple hunting trip by a father, his brother and their sons. It then evolves into a great mystery. A skeleton, a ghost, a murder, and a manhunt! How does this everyday family in the early years of the 1900’s in Oklahoma help solve the mystery? You are drawn into the lives of Shaw and Alafair Tucker and their large and extended family. The interaction between the family members is very well written. You feel as though this is a real family struggling to live and survive. Their reactions to the events they are drawn into are the same reactions I think you or I would have. I liked that the author gave us (and not the characters) the whole story of the mystery after the end of the book. It tied everything up in a neat little bow. 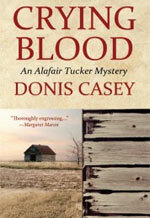 I look forward to new adventures of the Tucker family, set in Oklahoma shortly before World War I. “Blood” focuses not on Alafair, the sensible and unflappable mother, but on her husband, Shaw, whose hunting trip is disrupted by an otherworldly experience. A young Indian boy figures prominently in the action, as does some Tucker family history. We get a lesson in American-Indian policy and its tragic aftermath, as well. Casey gets full marks for creating fully realized, three-dimensional characters. As much as I like Alafair, I enjoyed getting to know Shaw as well. Casey’s nuanced portrayal of settler and native lives in early 20th-century Oklahoma lends soul and depth to her atmospheric fifth Alafair Tucker mystery (after 2009’s The Sky Took Him).